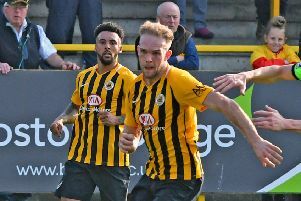 Craig Elliott has pledged there will be no more ‘gambles’ as he sets his sights on building a promotion-winning Boston United team. The Pilgrims boss is continuing his recruitment this week as he speaks to the squad members he wants to keep at the Jakemans Stadium next season. After this summer’s rebuild failed to work out as planned, Elliott was tasked with strengthening his side during the campaign, never an easy ask when targets are on the books of rival clubs. This has seen the Pilgrims forced to bring in free agents, non-contract players or look to the loan market to bolster their ranks. A total of 48 players have turned out for the club so far this campaign with Bradford City loanee Cameron Hawkes keen to become number 49 at Blyth Spartans this Saturday (KO 3pm). Having admitted to learning from the trials of this season, Elliott is determined to get the right people into the Jakemans Stadium as soon as possible. “They need to be National North standard now,” he told The Standard. 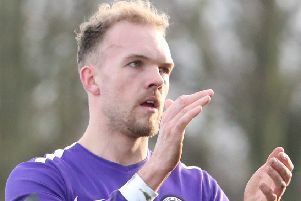 Elliott already has keeper George Willis, midfielders Nicky Wroe, Brad Abbott and Andi Thanoj, plus attackers Jay Rollins and Nicky Walker signed up for next season, while reserve keeper Dylan Parkin may also see his deal renewed. Other candidates for new deals could include Gavin Allott, Ashley Jackson, Jonathan Wafula, Ryan Qualter, Ben Middleton, Ryan Cresswell and Ben Davies, but strikers Jordan Slew, Jonny Margetts and Andre Johnson look unlikely to remain. “For all the lows, we’ve been a consistent top-eight or nine team this season,” said Elliott. “We’ve rarely dropped below that this season so we’re cemented in there. “It’s my job to get us to the next level, the top five.